In recognition of high school seniors who have exemplified great character and resilience, the Houston Independent School District is launching the HISD Superintendent and Board of Education Scholar Award – a scholarship of $5,000 or $2,000 awarded to one senior from every HISD high school. This entry was posted in Board of Education, High Schools and tagged HISD Board of Education, scholarships on May 4, 2018 by HISD Communications. The Houston Independent School District Board of Education on Tuesday adjourned without approving a contract to partner with the governing board of Energized for STEM Academy as part of Senate Bill 1882. The district will no longer pursue this proposal, nor will the district submit plans for partnerships to the TEA. The proposal was intended to give HISD a two–year pause on accountability from the Texas Education Agency (TEA) and prevent sanctions from the state related to House Bill 1842. HISD will continue to operate and manage the 10 campuses that have been in Improvement Required (IR) status with the state for four years or more. Those campuses are: Blackshear, Dogan, Highland Heights, Mading, and Wesley elementary schools, Henry Middle School, Woodson PK-8, and Kashmere, Wheatley, and Worthing high schools. The district’s goal is to help these 10 schools exit IR and continue to meet yearly standards. HISD will make the necessary changes to the Achieve 180 framework to ensure the district provides them with the additional resources and supports they need to be successful. District administration will be holding meetings with staff and parents at these 10 schools to discuss Achieve 180 plans for their campuses in the 2018-2019 school year. Staff will remain in place at these 10 campuses unless a position is closed as part of the reduction in force HISD is experiencing across the district due to the $115 million budget shortfall. This entry was posted in Achieve 180, Board of Education, Elementary Schools, High Schools, Middle Schools and tagged Achieve 180, HISD Board of Education on April 25, 2018 by HISD Communications. The Houston Independent School District Board of Education during its regular April meeting voted to approve a resolution calling for federal action related to school shootings. This entry was posted in Board of Education, District I - Elizabeth Santos, District II - Rhonda Skillern Jones, District III - Sergio Lira, District IV - Jolanda Jones, District IX - Wanda Adams, District V - Sue Deigaard, District VI - Holly Maria Flynn Vilaseca, District VII - Anne Sung, District VIII - Diana Dávila, HISD: Our Story, Teachers and tagged HISD Board of Education on April 13, 2018 by HISD Communications. This entry was posted in HISD: Our Story, News, Staff updates and tagged HISD Board of Education, HISD superintendent on March 23, 2018 by HISD Communications. The American Institutes for Research (AIR) released a comprehensive new report that finds HISD has already taken specific action that will enable the district to improve outcomes for students with disabilities and implement the report’s recommendations more effectively. This entry was posted in HISD: Our Story, News, Special Education and tagged HISD Board of Education, special education department on March 8, 2018 by HISD Communications. The Houston Independent School District Board of Education on Thursday approved a construction contract for the rebuilding of four elementary schools — Braeburn, Scarborough, Kolter, and Mitchell — severely damaged by Hurricane Harvey. This entry was posted in Board of Education, Budget, District I - Elizabeth Santos, District II - Rhonda Skillern Jones, District III - Sergio Lira, District IV - Jolanda Jones, District IX - Wanda Adams, District V - Sue Deigaard, District VI - Holly Maria Flynn Vilaseca, District VII - Anne Sung, District VIII - Diana Dávila and tagged HISD Board of Education on February 8, 2018 by HISD Communications. 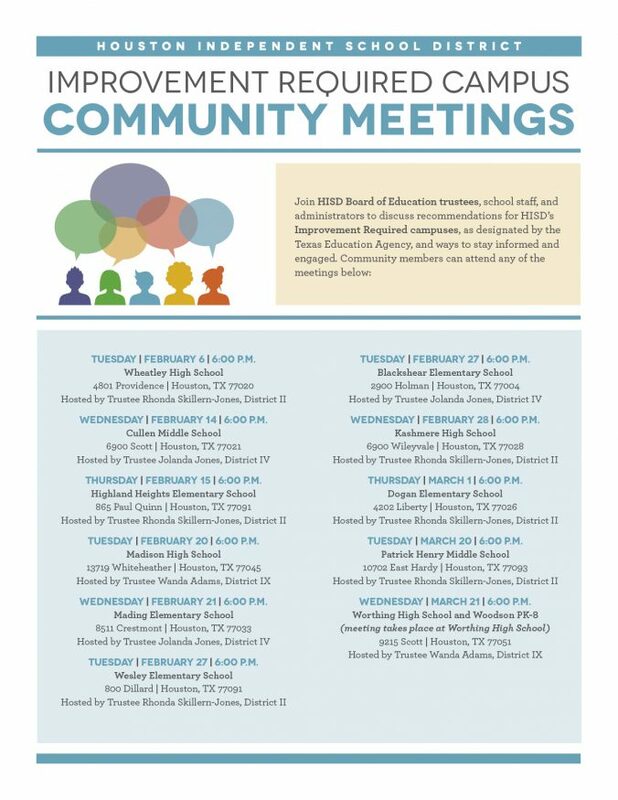 HISD Board of Education President Trustee Rhonda Skillern-Jones, Trustee Jolanda Jones, and Trustee Wanda Adams are hosting a series of community meetings at schools currently in “improvement required” status, or IR, as designated by the Texas Education Agency. This entry was posted in District II - Rhonda Skillern Jones, District IV - Jolanda Jones, District IX - Wanda Adams and tagged Communiy Meetings, HISD Board of Education on February 2, 2018 by HISD Communications. 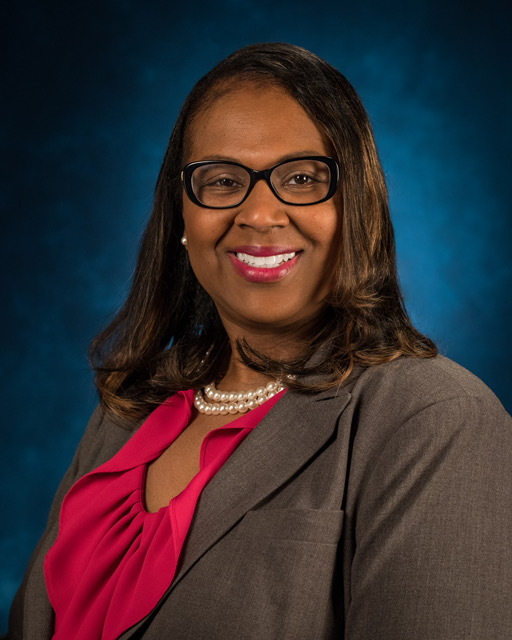 The Houston Independent School District Board of Education on Thursday approved turnaround plans for the campuses designated Year Two Improvement Required by the Texas Education Agency. This entry was posted in Achieve 180, Board of Education, Elementary Schools, High Schools and tagged HISD Board of Education on January 18, 2018 by HISD Communications. The Houston Independent School District Board of Education approved a revised turnaround plan for Kashmere High School during a special meeting on Thursday. This is the eighth consecutive year for Kashmere High School to be deemed as “improvement required” — one of the designations used by the TEA to determine whether schools are meeting state standards. As a result, the district is required to submit to the state a plan detailing how it will improve student achievement at the school. This entry was posted in Achieve 180, District II - Rhonda Skillern Jones, High Schools and tagged HISD, HISD Board of Education, Kashmere High School on November 16, 2017 by HISD Communications. The Houston Independent School District Board of Education on Thursday approved a resolution to strengthen current services provided to HISD students with special needs to succeed in the general education classroom. This resolution lays out a set of best practices for increasing the time that special education students spend in the general education classroom, while providing additional services and the support needed. The district recognizes the need to raise expectations for students with disabilities and educate them in the least restrictive environment. This entry was posted in Board of Education, HISD: Our Story and tagged HISD, HISD Board of Education on November 9, 2017 by HISD Communications.